The primary objective of enterprise architecture is to bring business, organization, and systems under a single governance roof. Whatever the CxO acronym put on that roof, what is at stake is the dynamic relationship between business and systems concerns, the former subject to external factors and driven by changing opportunities, the latter based on planned developments and constrained by organizational and technical factors. Managing that pivot cannot be achieved without principled hinges joining actual business environments and processes to serviceable symbolic representations (aka models). Defining such hinges is the aim of functional (aka representation) patterns. Architectural problems: solutions have to further the alignment of enterprise organization and systems with business strategies. Operational problems: solutions have to further lean and just-in-time processes. Business problems: solutions have to further continuity and integrity of symbolic representations with regard to business entities. Who (agents) is entitled to What (goals): Functional patterns should be first defined with regard to the type of agents (human, systems, or devices) and associated capacities as defined by enterprise organization and resources. Where (locations) and When (events): Then, patterns should consider the control of business processes, namely the action semantics supporting the collaboration between contributing agents. How (business logic): finally, given processes defined with regard to contexts (actors and events) and goals, the focus will be on scripting the sequence of operations affecting the representation of business entities. It can also be mapped to the GoF categories for creational, behavioral, and structural design patterns. Functional patterns are archetypes of system functionalities; they should not be confused with business patterns, which are archetypes of business activities, nor with conceptual ones, which are archetypes of thought disconnected from specific considerations. Whereas they can overlap with both, their purposes are essentially different as, contrary to the former they target system functional architectures, and, contrary to the latter they must stay anchored to the business under consideration (cf abstraction layers). Persistency patterns describe archetypes of dependencies between persistency units depending on synchronization constraints and responsibilities. Responsibilities patterns describe how active objects are “decorated” with interfaces or roles. Workflow patterns describe archetypes of dependencies between execution units depending on synchronization constraints, execution flows, locations, and access authorizations. Strategies describe patterns of activities independently of time constraints; transformation patterns describe data flows processing. Context and entry points patterns deal with boundaries between systems and contexts. They are the actual complement of user patterns, which deal with symbolic accesses. State patterns deal with the behavior of active objects as processed by workflows. Use case patterns deal with functional requirements from an architecture driven perspective. Finally, power-type patterns deal with archetypes of partitions as applied to objects (ontologies) and activities (controls). Representation patterns may be especially adapted to services oriented architectures since they don’t make use of abstractions but are nonetheless meant to map business processes into functional architectures built from services. Physical objects: passive, actual documents, agents, I/O devices, information systems, control systems. Symbolic representations (aka surrogates) for: physical objects, documents, roles, events, business logic, processes’ states. Roles (UML Actors) to be played by: people, systems, objects, documents, users, events, services, processes. Events: changes to physical or symbolic objects, expectations, computation, processes’ states. Actions performed on (passive entities)/by (active entities): people, physical or symbolic objects, actors, computations, processes execution. States of: physical or symbolic objects, interactions, devices, computations, processes. The same rationale is applied to containers. References between symbolic objects may be neutral regarding object states, or may entail synchronized updates. Flows between functional units may be neutral regarding execution (data), or may be associated with requests (control). Transitions between execution units may be neutral regarding their respective states (asynchronous) or may require synchronization. Communication channels between active objects may be neutral regarding objects connection (simplex), or may require synchronization. Stereotyped Connectors depending upon coupling constraints. Physical objects: state of relevant business features. Roles: record of agent activities. Record of process execution states. 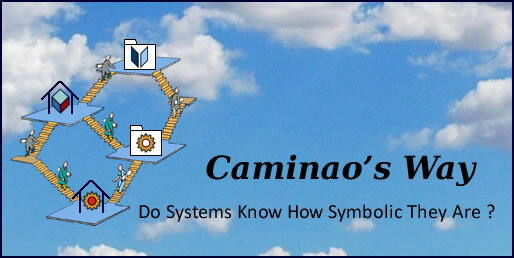 Symbolic representation of physical objects, documents, roles, events, activities, processes. Literals are symbolic features which can be interpreted directly. References are symbolic features whose interpretation require access to other objects. Numeric values are non symbolic features whose interpretation require access to other objects. Binary objects are non symbolic features which can be interpreted directly. External I/O are local operations, whose execution modify the status of symbolic representations vis-à-vis context counterparts. Computations are local operations whose execution doesn’t modify the status of symbolic representations vis-à-vis context counterparts. Transactions are symbolic operations performed globally, whose execution modify the status of symbolic representations vis-à-vis context counterparts. Searches are symbolic operations performed globally whose execution doesn’t modify the status of symbolic representations vis-à-vis context counterparts. It must be noted that this approach follows the Command-Query Separation introduced by Bertrand Meyer; moreover, by combining change with scope, it provides a sound basis to the Command-Query-Responsibility-Segregation (CQRS) design pattern used by domain-driven methods. One step further, attributes and operations may also be stereotyped in terms of their functional semantics.